2013 will be remembered by the way Russia scored some major victories in the diplomatic front, especially in Syria and Iran, but there were a few disappointments for Moscow as well. With the end of the Cold War far behind us, Russia’s foreign policy concerns in 2013 were largely focused on a "humanitarian" war against Syria and a disarming strike against Iran. However, thanks to diplomats' efforts those conflicts were at least put off. In both cases, Moscow played a leading role driven by its national interests. Russia's fundamental position on Syria was that an internal conflict should not become a pretext for a regime change, albeit one sanctioned by the United Nations, as was the case in Libya. This is not what the UN was created for, Russian diplomacy stated. Instead, Syria's political future should be decided by the Syrians themselves with the help, support and mediation of the international community through political dialogue. That is why Russia, together with China, three times vetoed resolutions at the U.N. Security Council that were based on deposing the Syrian President Bashar al-Assad. Paradoxically, the other G8 countries in effect joined Russia. Such was the outcome of the G8 summit in Ireland, where a consensus was reached to try and find a political solution to the crisis in Syria. Russia's partners were guided by somewhat different motives. By the summer, it became clear that the bulk of the military opposition fighting the government forces in Syria were radical Islamist organizations that share Al-Qaeda's principles and methods. That development was in nobody's interest: neither the West, nor secular Arab regimes, nor Russia. For Russia, where there are strong Muslim communities not only in the Volga regions and the Caucasus, but in Moscow too, and a spontaneous import of radical Islam from Syria poses a direct threat. That is why Moscow and Washington quickly agreed to hold a peace conference on Syria. But the use of chemical weapons in a suburb of Damascus, which was blamed on the government forces, forced U.S. President Barack Obama to choose a path that he studiously tried to avoid, that of a military action. 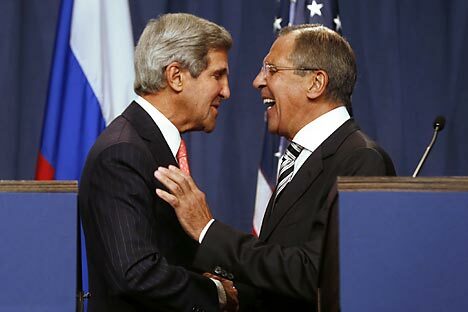 However, Russian Foreign Minister Sergey Lavrov stepped in to persuade him toward a different path. Avoiding the debate about who ordered the use of chemical weapons, Moscow persuaded Assad to agree to have all of Syria's chemical arsenals destroyed, thus neutralizing the arguments of those who wanted to drag the U.S. into yet another war. Work to eliminate Syria's chemical weapons and capabilities is now in full swing. What has the world gained? Strategic stability in the Middle East has been preserved. The nuclear non-proliferation regime has been further strengthened, the role of the U.N. and the Security Council in maintaining peace has been bolstered, and the whole international community to benefit from these outcomes. The use of force was avoided in the case of Iran, too. Moscow, while supporting U.N. sanctions against Iran, has nevertheless always demanded that the Iranian nuclear issue be resolved at the negotiating table. In addition to defending U.N. principles, Russia seeks to avoid not only a military nuclear program in Iran, but mass disturbances caused by Western sanctions and chaos that a military strike would create. That was the thinking behind the so-called Lavrov plan that originated two years ago and that envisages Iran's gradual concessions on its nuclear program in exchange for a gradual abolition of sanctions. Step by step, away from "the red line," that was the principle in the foundation of the interim agreement between Tehran and the “five-plus-one” group that was reached in November. The deal reached so far covers a period of six months, and there are no reasons to expect easy negotiations on the main agreement, which should remove the main concerns of the international community, give Iran an opportunity to develop its peaceful nuclear program and, most importantly, remove the threat of a conflict in the region. A lot will depend on 2014. It should be stressed that Russian diplomacy has achieved these successes largely because its interests coincided with the fundamental interests of the main global players. But that is not always enough. The year 2013 was also marked by a crisis in Russian-U.S. relations. Formally, it was caused by the escape to Moscow of Edward Snowden, the leaker of NSA secrets. Clearly, Washington was very irritated and concerned by the fact that this whistleblower remained outside the reach of the U.S. justice system. However, it is difficult to believe that it was that fact alone that prompted Obama to cancel his visit to Moscow. Moves like that were typical of the time of bickering between Khrushchev and Eisenhower during the Cold War years. It is more likely that the White House realized that were Obama to return from Moscow without Snowden, that would serve as yet another reason to accuse him of weakness. Whereas Putin, notwithstanding a desire to resume the dialogue with the American president on the wave of cooperation on Syria and Iran, had no intention of caving in to the U.S. Equal relations – that is the doctrine of Russian foreign policy today. Having said that, it would be wrong to conclude that the Russian-U.S. dialogue is over. Putin and Obama had a one-to-one meeting at the G20 summit in St Petersburg after the Moscow visit had been cancelled. It is obvious that they will have another meeting, probably at the G8 summit in Sochi this summer. It is possible that by that time, the two countries' presidents will find a basis for compromise.